Kunal Khemu is back after a long time with a film produced by T-Series, directed by Shivam Nair. It has music by Yo Yo Honey Singh, Mithoon, Arko and Devi Shri Prasad. 1. Daddy Mummy – Singers: Devi Shri Prasad (DSP), MM Manasi; Music: Devi Shri Prasad (DSP); Lyrics: Kumaar – Kumaar shows his vulgar avatar on the Hindi remake of a Telugu song ‘Aakalesthe Annam pedatha’ from the movie ‘Shankar Dada Zindabad’ The techno tune that constantly plays in the song is catchy and attractive yet quite stodgy. MM Manasi does have an attractive voice but doesn’t have the ability to hold the listeners for long. A repetitive sounding stuff with extremely cheap lyrics. 2. Iss Qadar Pyar Hai – Singer: Ankit Tiwari; Music: Arko; Original Music: Sajid-Wajid; Lyrics: Arko; Original Lyrics: Faaiz Anwaar – Have you heard the original one? Yes? Then it must be among your favorite songs. And you definitely won’t feel good for your favorite song to be spoiled. Arko is not to be blamed. T-Series is to be blamed here. Ankit Tiwari in not anyway can reach to what Sonu Nigam had done in this song from his very first album Deewana. The change that Arko brought in the first line of antara spoils everything. The rest is handled by Ankit’s vocals. Attempt it to hear how it sounds in 2015. 3. Aankhon Aankhon – Singer: Yo Yo Honey Singh; Music: Yo Yo Honey Singh; Lyrics: Yo Yo Honey Singh – Obviously when it’s Honey Singh, it has to be catchy. The point is that it’s not addictive. You are not eager to hear it more after the first attempt. That’s enough to say how good or bad this song is as there are no other measures like melody, instruments, arrangements to judge the goodness of the song. Catchy but neither addictive nor groovy. 4. Kinna Sona – Singer: Sunil Kamath; Music: Mithoon; Lyrics: Amitabh Verma – After a very long time, Mithoon is back in his original form, the way he used to compose in his early days though the composition unfortunately doesn’t turn out so well. Still, considering the level of the album, it is such a relief to finally here a soulful original composition. Sunil Kamath’s vocals are perfectly suiting the mood of the song which has been arranged well enough to be liked. A relief! Even after delivering ordinary compositions, Mithoon still saves this hopeless album wonderfully! April 29, 2015 by Dreamz Unlimited! 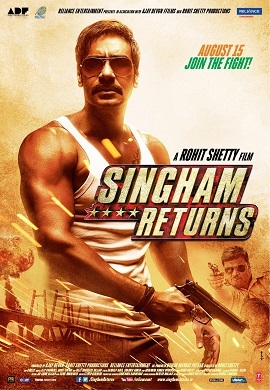 So, Akshay Kumar is back with again a massy entertainer based on corruption. It’s a Viacom 18 and Sanjay Leela Bhansali’s joint venture. The movie has been directed by a debutante Krish. The soundtrack has been kept very short consisting of just four songs, two by Chirantan Bhatt, and one each by Yo Yo Honey Singh and Manj Musik. CLICK HERE to buy Full Soundtrack of Gabbar Is Back from iTUNES!! 2. Coffee Peetey Peetey – Singers: Dev Negi, Paroma Das Gupta; Music: Chirantan Bhatt; Lyrics: Kumaar – This is very unusual from what Chirantan Bhatt generally does. The beats that have been wonderfully programmed are the highlight of this track. Dev Negi sounds way too similar to Arijit along with Paroma’s decent attempt and Kumaar’s uniquely simple lyrics make this song a worth listen! 3. Aao Raja – Singers: Neha Kakkar, Yo Yo Honey Singh, Teflon; Music: Yo Yo Honey Singh; Lyrics: Sahil Kaushal – And then there’s another composer-lyricist jodi from whom you can expect nothing but some non-intelligent and non-creative stuff which relies only on the programming which also has been done in a way that sounds too irritating to attempt it twice. The way Neha Kakkar has sung, although intentionally, sounds awful. This is one of the most disappointing works of Yo Yo Honey Singh. 4. Warna Gabbar Aa Jayega – Singers: Manj Musik, Raftaar; Music: Manj Musik; Lyrics: Manj Musik – A sort of a theme track that has just one line on the repeat mode consisting of some gabbar related dialogues and a minor rap by Raftaar. Not worth the time. A soundtrack otherwise spoiled by Yo Yo Honey Singh and Manj Musik, is beautifully handled by Chirantan Bhatt by his two cracking deliveries. November 6, 2014 by Dreamz Unlimited! Shaukeen an old film based on the same concept has been remade into The Shaukeens to make it look and sound modern. A story about 3 old flirts. It’s a multi composer album consisting of four composers, two by Yo Yo Honey Singh, two by Vikram Nagi, and one each by Arko and Hard Kaur. CLICK HERE to buy Full Soundtrack of The Shaukeens from iTUNES!! If somebody’s drinking Chaar Botal Vodka, then obviously he would be called Alcoholic so that’s only what Yo Yo is trying to say. It’s kind of a sequel to Chaar Botal Vodka. Surprisingly the song has not been written by Yo Yo this time. It’s Sahil Kushal who had written Party All Night from Boss. Leaving the lyrics as it’s an old tiresome formula of writing, the beats are good enough to shake you though not better than some of Yo Yo’s previous songs. Honey Singh always gets tolerable for Akshay Kumar. Vikram Nagi impresses with the beats and the arrangements. Even having not-so-good tune, the song engages only because of the kind of beats it has. A three antara song which Shabbir Ahmed has written with betterment as the lyrics atleast did have some meaning. Ishq has been compared with a dog (not a new concept) and using Mika in these kind of songs is getting exhausting for the listeners. Vikram should have had worked more on the basic tune. A decent engaging track though not having the retaining power. We just have heard him in Ek Mulaqat from Sonali Cable and we liked him. It’s Jubin’s second song and he nails it one more time. His voice is damn soothing and has does enter deeply into you. Arko is fabulous equally with music and lyrics. Just after a beautiful track Dildara from Tamanchey, he again delivers a beautiful romantic track having a very connecting lyrics that can be sung by any lover while proposing. It’s a “thank you” song to the person you love. A beautiful comparison of what “she” is and what “he” is for her. Hai saaz tu, tera tarj main, Tu hai dawa, aur marz main, Dildar tu, khud garz main. This is all about aashiqui. The word has been used here so many times that it would definitely have not been used combining Aashiqui and Aashiqui 2. Hard Kaur completely fails to provide the needed joy and fun in this track. Selecting Aman Trikha is the only good thing in this track. The tune, beats, arrangements all are sounding very stale, particularly the tune of mukhda sounds very similar to Dilliwali Girlfriend. Lyrics is pathetic, clearly showing how less creative the lyricist is. Not worth the fun. Why Anu Malik? Vikram Nagi, why Anu Malik? I don’t find a single reason for choosing Anu Malik for this otherwise lovely track. The computerized vocals surprisingly didn’t irritate me and the antara is truly awesome. Now bringing Anu Malik and that computerized voice, this song goes into the humor zone which is otherwise a decent romantic track. This song would definitely be in my playlist if somebody other than Anu Malik would have sung it. Nice composition is sadly driven to a humorous ride. The Shaukeens is for the shaukeens of Yo Yo Honey Singh. Leaving Hard Kaur, each of the composers impresses.